Please contact the Law Society if you would like a personalised timetable. 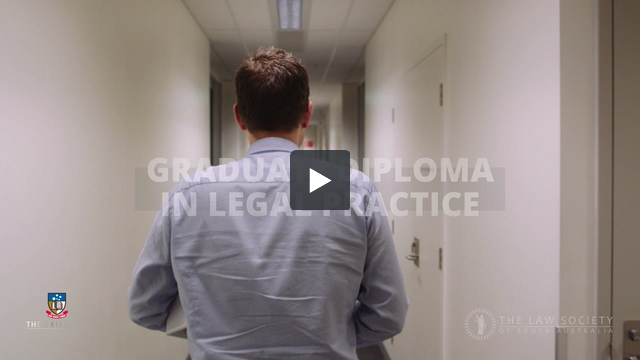 The Law Society together with The University of Adelaide jointly delivers the Graduate Diploma in Legal Practice (GDLP) for eligible law students. Completion of the GDLP is required for law graduates before they can be admitted to practice, and our GDLP also provides some unique benefits. Enrol in the GDLP at any time! Students can commence their GDLP while their LLB studies are being completed (subject to conditions) and complete the course in as little as 20 weeks. Every month of the academic year students may enrol, and you can commence with an elective or a core subject it is your decision! We now offer Administrative Law Practice online as an elective option and hope to also offer Banking and Finance and Consumer Law online in 2019. Our GDLP program is unique as it will provide you with direct access to the profession. Our students are taught by legal professionals in touch with current practices. You will be building your network of contacts and learning to work collaboratively with your future colleagues from day 1. Our GDLP students are invited to exclusive networking events with Law Society members, including those responsible for employment. Students will meet decision makers in the profession and receive advice on how to best place themselves for employment opportunities. We are the only GDLP provider that will assist you to find a work experience placement. Many firms we deal with use our students exclusively. Plus, you can claim up to 3 weeks in retrospective credit towards the 6- week requirement for work placement. Our students have the unique opportunity to learn and practice their advocacy skills with current judicial officers, senior practitioners and barristers, in an actual court! This part of the course has been a highlight for our graduates, with many commenting that the experience gave them an unparalleled insight into court work and a real boost to their confidence. We offer classes over weekdays, evenings and weekends. A typical full-time load will only involve 17.5 days face to face seminar time over 20 weeks. The Legal Practitioners Education and Admission Council (LPEAC) requires that students complete their academic qualifications for admission prior to commencing PLT. Students who want to commence PLT before completion of their academic requirements for admission must apply to the Board of Examiners for exemption prior to enrolling in a PLT course. The Guide to making an application for exemption to the Board of Examiners is available here, and a template affidavit, is available here. The prize was established by donations from the Hon Margaret Nyland AM and 2016 Law Society President, Mr David Caruso. The number and value of prizes awarded in any one year will be at the discretion of the selection panel. The prize shall be called "The Nyland and Caruso Prize for meritorious performance in the Graduate Diploma of Legal Practice". The value of the prize per recipient will be no more than $1,500, there will be no more than 3 recipients in any year and the total value of the prizes will be no more than $1,500, or such other amount as the University shall determine. Any student wishing to be considered for the prize must be a graduate of the Adelaide Law School, be enrolled in at least 12 units of the Graduate Diploma of Legal Practice in the year in whey they apply, have successfully completed the Foundations of the GDLP (or equivalent) and one other GDLP course and must not have previously been awarded this prize. Applicants must submit a written application demonstrating sufficient academic merit and one or more of the other selection criteria (refer point 6). The selection of successful candidate(s) will be at the absolute discretion of the selection panel. Particular regard will be given to applicants who demonstrate financial need, be an Aboriginal or Torres Strait Islander, be from a cultural background under-represented in the legal profession in South Australia, or have a disability. If there is no candidate of sufficient merit in any given year the prize will not be awarded. If there is more than one candidate of sufficient merit, multiple prizes may be awarded. The University may vary the rules from time to time in a manner consistent with the University's legal obligations and policies. Read about the Prize on the University of Adelaide website. The Law Society and The University of Adelaide are pleased to announce the continuation of their joint GDLP Indigenous Law Student Scholarship Program, after the success of the inaugural scholarship in 2016. One Aboriginal or Torres Strait Islander law student per year will have their mandatory practical legal training course program fully paid for as part of the scholarship. The GDLP scholarship – a joint initiative between the Law Society and The University of Adelaide – is one of several programs the Law Society is involved in to promote reconciliation and a “fair go” for indigenous people. For inquiries, please get in touch with the Law Society’s Desiree Holland Desiree.Holland@lawsocietysa.asn.au or the Adelaide Law School’s Professor Alex Reilly alexander.reilly@adelaide.edu.au. Apply NOW for the Adelaide GDLP program via SATAC (using code 3GD087). For sample course plans and enrolment enquiries contact lawenquiry@adelaide.edu.au or go to the University Website.